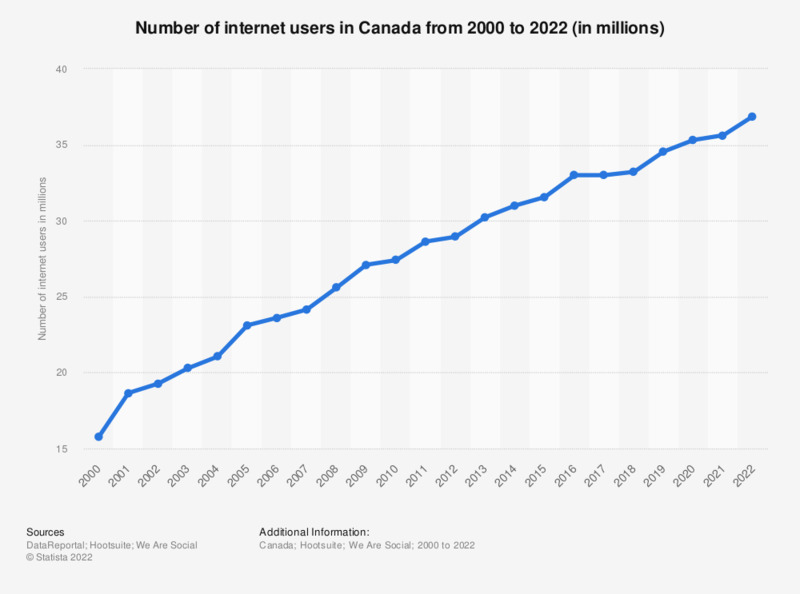 This statistic gives information on the number of internet users in Canada from 2000 to 2016. As of July 2016, Canada had an estimated 32.12 million internet users. That year it was calculated that online services reached 81.19 percent of the population. Canadians are spending more and more time online. As of 2016, Canadian adults were spending 22.8 hours per week online. Most if this time was spent with video content, followed by text and interactive content. Statistics on online penetration, sorted by age group, show that internet usage in 2016 was the highest among those between the ages of 12 and 54. While eight percent of Canadians said they used the internet at least once per week, 88 percent of online adults in the country accessed the internet on a daily basis.